The new Adcom GFP-815 supports a broad audio spectrum from 10Hz to 100kHz for high level sources and 20Hz to 80kHz for phono input. The GFP-815 is designed to capture all the fidelity that high resolution audio has to offer, with precision broadband components and an ultra low noise floor. 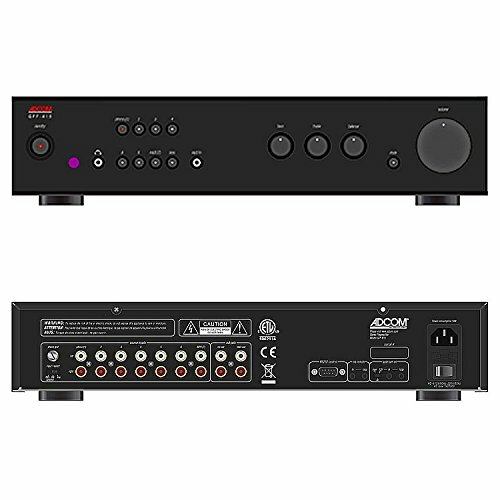 This new ADCOM preamp hasn't forgotten about your legacy or new components and provides you with support for source products ranging from turntables to MP3 players. Pair the GFP-815 with an ADCOM power amp and rediscover the magic of two channel audio. Power 120-230VAC-50-60Hz. Seven analog source inputs include MM-MC Phono and MP3. Headphone jack, remote control with source selection. 12V trigger, RS232 Control, External IR input. If you have any questions about this product by Adcom, contact us by completing and submitting the form below. If you are looking for a specif part number, please include it with your message.